Some say the fetus is the "tiniest citizen." If so, then the bodies of women themselves have become political arenas--or, recent cases suggest, battlefields; A cocaine--addicted mother is convicted of drug trafficking through the umbilical cord. Women employees at a battery plant must prove infertility to keep their jobs. A terminally ill woman is forced to undergo a cesarean section. No longer concerned with conception or motherhood, the new politics of fetal rights focuses on fertility and pregnancy itself, on a woman's relationship with the fetus. How exactly, Cynthia Daniels asks, does this affect a woman's rights? Are they different from a man's? And how has the state helped determine the difference? The answers, rigorously pursued throughout this book, give us a clear look into the state's paradoxical role in gender politics--as both a challenger of injustice and an agent of social control. In benchmark legal cases concerned with forced medical treatment, fetal protectionism in the workplace, and drug and alcohol use and abuse, Daniels shows us state power at work in the struggle between fetal rights and women's rights. These cases raise critical questions about the impact of gender on women's standing as citizens, and about the relationship between state power and gender inequality. 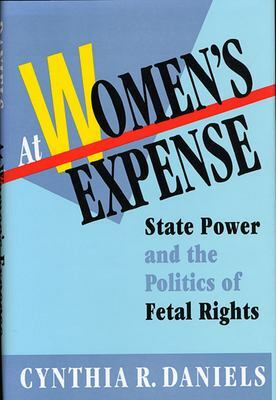 Fully appreciating the difficulties of each case, the author probes the subtleties of various positions and their implications for a deeper understanding of how a woman's reproductive capability affects her relationship to state power. In her analysis, the need to defend women's right to self--sovereignty becomes clear, but so does the need to define further the very concepts of self-sovereignty and privacy. The intensity of the debate over fetal rights suggests the depth of the current gender crisis and the force of the feelings of social dislocation generated by reproductive politics. Breaking through the public mythology that clouds these debates, "At Women's Expense" makes a hopeful beginning toward liberating woman's body within the body politic.